A simple story, elaborately told: Panchali, the Pandava queen, desires a mysterious, alluring flower that the wind has flown in. Bheema, the most daring, gallant, and also bombastic of the Pandavas promises to get them for her from the fiercely guarded, secret garden of Kubera, the God of Wealth. Bheema starts his mission with characteristic aggression, destroying everything he encounters in his quest. As he nears the garden, he encounters Hanuman, who is meditating. Upset at the brashness shown by his brother, Hanuman decides to teach him a lesson in humility. He disguises himself as an old monkey who is unable to move out of the way. No matter how much he tries, Bheema is unable to move him, and soon he realizes that this is no ordinary monkey. Hanuman reveals himself, and the brothers are overjoyed to meet. Bheema pleads to see his true cosmic form. The reveal, however, shocks him to a state of unconsciousness. Upon waking up, he asks for forgiveness. Hanuman then tells him of the secret place where the flowers grow. Bheema battles the guardians of the garden and brings the flowers to his dear Panchali. This was a 30-minute long pavakathakali (glove puppet) rendition of “Kalyana Sougandhikam” (The Flower of Good Fortune)—an excerpt from the Mahabharata—by the Natana Kairali puppetry company of Kerala on November 14, 2017 at the opening of “Indian Puppets: The Great Stories and Dancing Dolls,” an exhibit showcasing a representation of Indian puppetry at Atlanta’s Center for Puppetry Arts. 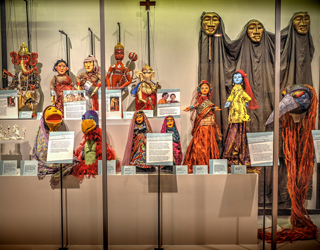 The puppetry group is famous for reviving a fading traditional puppetry art form. 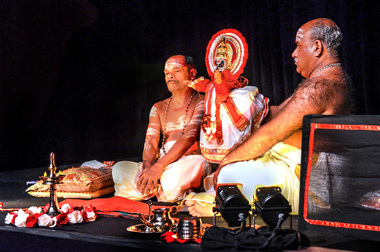 When the five performers, dressed in simple white attire with gold trim, took to the stage, their voices and movements and the somewhat overpowering accompaniment of Carnatic vocals and instruments such as the chenda (drum), chengila (gong), illetalam (cymbals) and shankh (conch) dominated the space. Soon enough, the performers skillfully shifted the spotlight onto the puppets, dressed in bold Kathakali costumes, their theatrical movements in perfect rhythm with the dramatic background music. It’s the Year of India 2017-18 in Atlanta—not only at Kennesaw State University, but at the Centre for Puppetry Arts (CPA)! 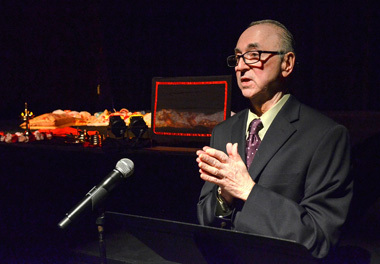 The performance described above was commissioned by the Indian government’s Indian Council for Cultural Relations (ICCR), facilitated by the Indian Consulate of Atlanta. CPA’s year-long dedication to puppets of India includes a special exhibit and events (see below for schedule). 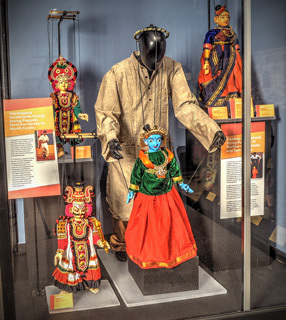 Indian puppets are already part of the permanent international collection at the Worlds of Puppetry section; however, this is the first time that the CPA has focused on a specific country in this manner. Even for some Indians at the opening, this performance provided a fresh take on Indian puppetry, the face of which is often relegated to the colorful string puppets (kathputlis) of Rajasthan. 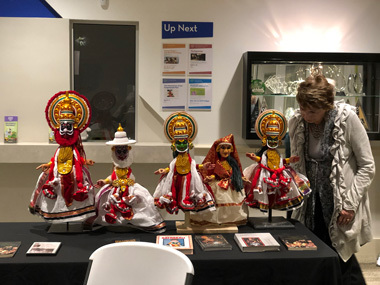 Just as there is more to Indian puppetry than kathputlis, there is more to Indian arts than Bollywood, as was acknowledged by Nagesh Singh, Consul General of India – Atlanta. “This is a step toward opening the eyes of the international community to the rich, diverse art forms of India,” he commented, shortly after he and Mr. Vincent Anthony (President and Executive Director, CPA) jointly cut the ribbon and unveiled the exhibit. Samples of puppetry styles and forms from the north, east, west, and south of India were procured with the help of the ICCR, e.g. marionettes (kathputlis) from Rajasthan, rod puppets (danger putul nach, “dance of the wooden dolls”) from West Bengal, shadow puppets (togalu gombeyaata, “play of leather dolls”) from Karnataka and of course, the glove puppets (pavakathakali) from Kerala. “While the diversity is almost impossible to capture, it provides a rich content,” says Kelsey Fritz, Museum Director, CPA. 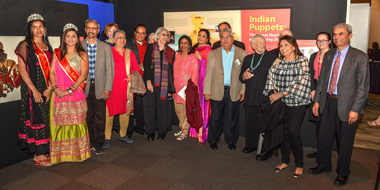 The curators also wanted to highlight the reinvention of Indian puppetry arts with the emergence of contemporary artists. “One of my favorite parts of curating this exhibit was to learn about how contemporary artists are breathing new life to a traditional art form,” says Dr. Kathy Foley, one of the key curators of the exhibit. The modern artists section includes mainstream names, such as Ramdas Padhye (commercially successful ventriloquist) and Puran Bhat (who revived a slum in New Delhi to a Kathputli Colony). Other artists use puppets to address social and environmental causes, e.g. Dadi Pudumjee (Ishara Puppet Theatre Trust, UNIMA) and Anurupa Roy, who includes modern materials like plastic to make masks, sculptures, and puppets ranging from 3 inches to 40 feet tall for therapy workshops. The exhibit shows an ancient art form to a younger audience more tuned in to digital entertainment. “The educational value of puppetry is immense, especially as a tool to introduce ancient stories and history to young children,” says Vir Nanda, board member at the Center. Although short on programming, the year-long celebration is an acknowledgement of the growing Indian population in the Atlanta area, as well as a refreshingly welcome attempt to draw attention to a lesser known facet of a rich, ancient culture. Celebration of India Family Day: readings of The Wheels on the Tuk Tuk and a book signing with author Sue Sehgal, special gallery programs, puppet building activities, and more. Screening of Tomorrow We Disappear, a documentary about Kathputli Colony, an Indian community of artists, magicians, acrobats, and puppeteers, as they wrangle with the reality of their approaching eviction. 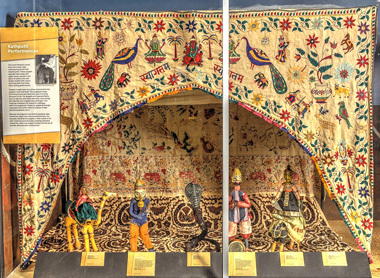 Lecture: Puppetry of India by Dr. Kathy Foley and Karen Smith, curators of Indian Puppets: The Great Stories and Dancing Dolls. Natanakairali from Trichur (India) plays "Dakshayagam"
"Curator: Indian Puppet Exhibition Offers Deeper View of an Ancient Culture"